Alex Dunbar believes suspended stand-off Finn Russell will be sorely missed by Scotland when they tackle Italy. The winless pair play at Murrayfield on 28 February in the Six Nations, but Russell is banned because of a dangerous tackle on Wales' Dan Biggar. "It was a bit unfortunate - he misread the flight of the ball," said Dunbar. "I spoke to him afterwards and he said didn't think he'd get there, so he tried to pull out, and he's turned away as Biggar's in the air." The Six Nations disciplinary committee statement said the Glasgow Warriors player's actions in the 23-26 defeat were "reckless rather than deliberate". The Scottish Rugby Union has announced its intention to appeal the decision. Russell, who also played in the defeat by France, has become a regular feature of head coach Vern Cotter's Scotland side. "He's playing really well just now," said centre Dunbar. "He's a huge exciting talent around the pitch, creates a lot, and has a go in defence as well - he puts in some big tackles. I think it'll be a big loss for the team. "I think he could have been slightly earlier in his positioning, and realise that if he's not getting there, leave it. Everything got on top of him and he tried to duck out of it last-minute, which obviously didn't help the team." 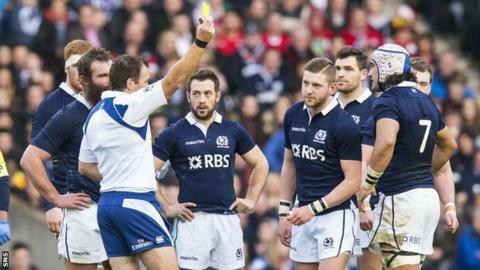 Russell received a yellow card for the aerial challenge, with Dunbar frustrated by the depleted Scots' concession of ten points in his absence. "It's the law so it's the way it goes: if you touch a player in the air, you know you're getting a yellow," he said. "I thought we were going well at the time and it's an area of the game where they capitalised well when we were a man down. I think it was a tough call, but it's the law, so you've got to go with it"
Alongside Glasgow Warriors colleagues Russell, Mark Bennett and Tommy Seymour, as well as Edinburgh's Matt Scott and Tim Visser, Dunbar is part of a new-look clutch of exciting Scottish backs. "There's a huge amount of potential there - we've started to show what we can do, but going from training, there's a lot more to come out of the squad," said the 24-year-old. "The backs have created a lot in this championship, but we know how much more we can create if we can get quick ball - that's what we're working on this week and next week in training. "We've improved a lot, we're in contention to win games, it just comes down to small margins. The yellow card on the weekend didn't help us, and then on the back of that for their try, we jumped out of defence, gave them overlaps and you can't do that at this level or you'll get punished. "At times composure has been a problem when we get into the finish zone. We need clarity on everyone knowing their roles, everyone going the same way and buying into the system. At times we fall away from what we're trying to do. "If we can get that, and gel as a team, we'll definitely put a side away soon." Second-row Tim Swinson, who joined the squad on Wednesday as a replacement for the injured Richie Gray, said Scottish enhancements made under head coach, Vern Cotter, are evident. "In the last six to ten months it's really pushed forward," he said. "There are a lot of positives from the games - the crowd reacted to that, which is fantastic to see. "We've got to keep focusing on things we've done well, but at the same time work on the negatives."